This particular sheet has a number of combatants from the 1961 Bay of Pigs debacle. Well, it was a debacle from the point of view of the CIA, which funded and controlled the operation. Really, it was one of those things where if something could go wrong, it did. Much of it due to poor planning and a lack of real commitment by the CIA and the US to actually push this thing through. Anyway, this sheet contains six different subjects. 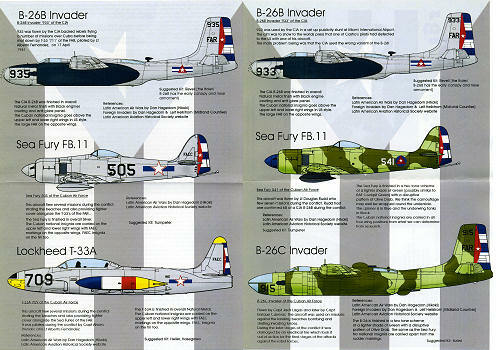 There are two B-26C Invader gunships as painted up by the CIA to appear to be Cuban aircraft. These are both in unpainted metal. Blackbird provides the red triangle and blue stripes with the builder needing to paint the rudder white prior to application. 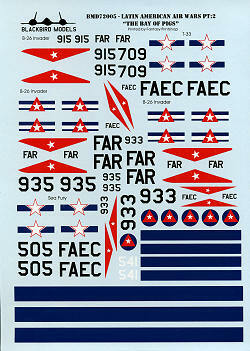 There are two Cuban Sea Furies, each in different colors and markings. At least the fuselage insignia markings are not the same. One is in overall silver lacquer with the 'star and bar' type markings. The other is in overall light green with a disruptive OD camo applied. This has the current style of insignia. This aircraft also has a blue spinner and black under wing fuel tanks. In the same camouflage is a Cuban B-26. This one has no wing or fuselage insignia. Note that this is a glass nose ship. Cuba did not have any gun nose B-26s. The final option is a T-33. These were armed with two .50 cal machine guns and like the Sea Furies, was credited with shooting down a CIA B.26. Unpainted metal with yellow nose and fin tip. The fuel tanks were in bands of blue, white, red, and yellow. Instructions are very nicely done and in full color with a brief history on the back of the sheet. The decals are very nicely printed by Fantasy Printshop in the UK. It would have been nice to have a planform drawing to show exactly where the wing insignia and marking are to go on the Sea Furies and T-33, though you may be able to decipher much of this from looking at the profiles. There are many kits in 1/72 that can be used for these aircraft. Thanks to www.blackbirdmodels.co.uk for the review sheet. You can find this and other products on their website.